Although not really a recommended thing to do, sometimes it is fun to be the tourist. Well, I'm from Vancouver, so since I was in San Francisco, I would be a "tourist". However, I have family down here and have visited well over a dozen times. Thus, I feel more like a local than a tourist. So visiting places like Fisherman's Wharf is both a bit boring and predictable. 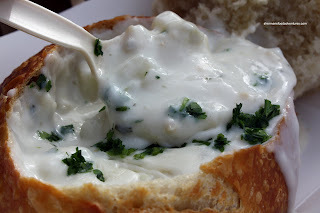 For some reason or another, I have never tried clam chowder in a sour dough bowl on the Wharf before. Too touristy? Probably. Now, there are many places to get clam chowder down at the Wharf. I had some last time at the Pier Market and it was less than stellar. I know, I know... Tou rist trap = mediocre food at high prices. 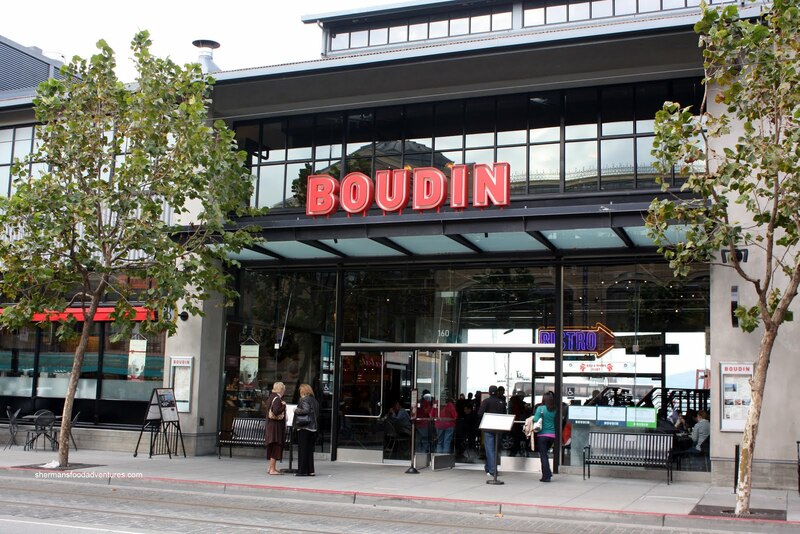 With that in mind, it didn't stop Kim and I from visiting Boudin Sourdough Bakery for their "famous" Clam Chowder in a sourdough bread bowl. Isn't everything world famous at tourist traps anyways? I'm sure even the corn dogs are world famous. Well, the clam chowder wasn't too bad. It was thick and had the requisite clam taste. Not a whole lot of clam meat though. As mentioned, it was thick; but not all that creamy though. It had a sweet onion flavour; yet missing the slight smoky savouriness from bacon ( not sure if they even used any). The sourdough held up to the soup and was indeed sour and chewy. It did what it was suppose to do. Better than Pier Market; however, it is hardly a great clam chowder, just an acceptable one. For variety purposes, we asked the person behind the counter to recommend a second item. The first thing she said was the pizza and that was good enough for us. 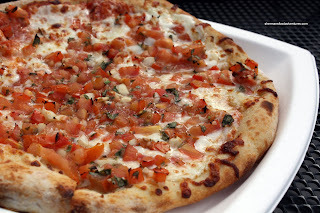 We went for the Tomato, Garlic and Basil Sourdough Pizza since we lik e it simple when it comes to pizza. 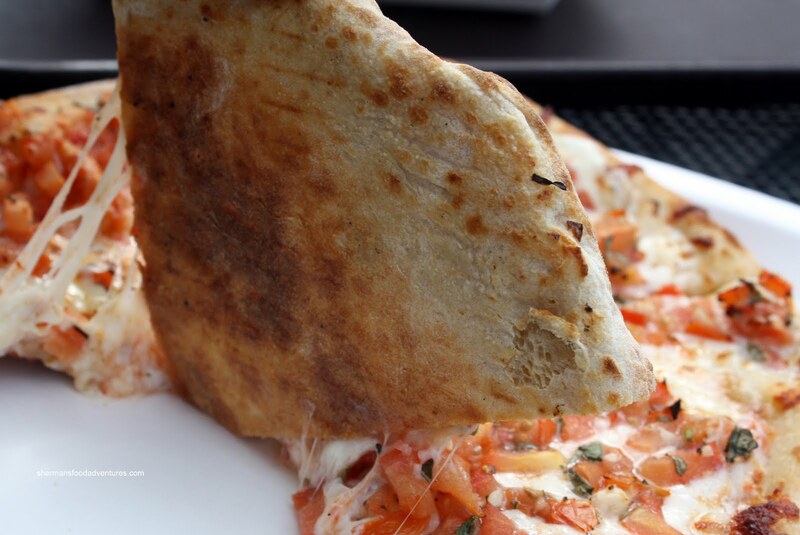 For a thin crust pizza, this wasn't too bad. Plenty of fresh toppings including a whole lot of tomatoes and garlic. I could really taste the garlic and in fact, it was probably a bit too raw. I prefer mine cooked more. Nice tang from the tomatoes and only a hint of basil. I liked the sourdough crust. It was not as thin as it could be; but crunchy and nicely browned nonetheless. It is what it is. The food is alright while the sourdough is pretty good. However, the place is still a tourist trap where food is priced on the higher side. Moreover, there is better food found elsewhere. Once again, it serves a purpose and you really can't deny that. Putting up with you is easy, it's TS that bugs me!